The questions remained. Who were James and Martha's 10 - or 11 children, was Harrison involved in the railroad scandal, did James' really own a plantation in Tennessee, and who was Nelson? I know I said I was staying put in Michigan, but upon learning that James originated in Wallkill, New York, I felt the compulsion to put out feelers. I found, and joined, the OCGSNY Yahoo group; learning of their existence from the now defunct Scotchtown Highlander website where owner Sal had pointed me to the Orange County Gen Soc. I posted my first query in 2012. (I told you this journey took it's sweet time!) Where I immediately received a flurry of interesting responses. Holy BSOs! All of a sudden I'm off and running! 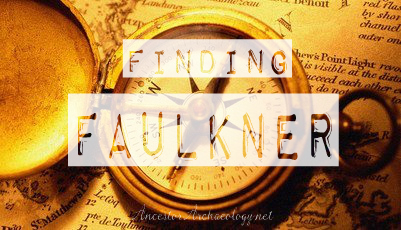 The hints and possibilities at actually finding Faulkner burgeoned! I got so excited I lost sight of my trajectory temporarily. Requesting books from Interlibrary loan, making mad copies (good to work at an office with a copier - shhhh, don't tell), chasing my tail ....... and smacking, yet again, into a brick wall. Alack, New York is an adventure for another day. Anson was most likely a son - but who's David? Another mystery. The Seeking Michigan database is magnificent. I was able to find and download most of the children's death certificates - for free! All of them listed James and Martha as the parents - score! Interestingly, Antoinette Faulkner was listed as being born in 1825 - the same year Harrison was reported to have been born. Twins? I have not found a definitive birth date for Harrison yet - another piece of the puzzle still amiss. The hunt for Nelson was proving futile. I found two land purchase records in 1837 adjacent to James. He did not show up in the 1840 census, unless he was still included in James' household. Then I found two land purchases for a Nelson Faulkner in Mineral Point, Wisconsin in the 1840's. Nothing else was turning up and I felt I was getting sidetracked. Nelson would have to be put aside. Digging up more on the railroad scandal was also proving fruitless. There were records housed at the University of Michigan, but that would require a trip to their archives. I decided to leave Harrison behind as I focused on the third piece of the Michigan puzzle. James' Tennessee plantation. I had not been successful in finding anything indicating a land purchase or sale in the state of Tennessee for James Faulkner. Only those Kentucky land grants,and those were highly doubtful. Back to the census records, I located James in every U.S. census from 1810 to 1860. I found him in Wallkill, New York from 1810 to 1830 and I found him in Grass Lake, Michigan from 1840 to 1860. It was appearing that the plantation story was a myth. Employing a timeline I deduced that it would be nearly impossible for James to have actually lived in Tennessee for the length of time it would take to run a plantation. All of his children were born in Wallkill, as I had discovered on their death certificates, a time spanning nearly two decades. However, to my deep dismay, I did discover that James was a slaveholder for a brief time. The 1820 census reports: "Slaves - Males - Under 14: 2; Slaves - Males - 26 thru 44: 1; Slaves - Females - 26 thru 44: 1" Ugh. This I did not want to see. There was also one "foreigner not naturalized" reported - I have yet to investigate this. By the 1830 census James' household consisted of 13 "Free White Persons" and one "Free Colored Persons - Males - 10 thru 23". So the story in Harrison's obituary had a glimmer of truth about it - but just a glimmer. By 1840 there were only 10 "Free White Persons" in James' household. Feeling that my additional time spent in Michigan proved fruitful; bountifully so, it was time to push ever Eastward toward New York. Curious to see what the War of 1812 could tell me, and dig deeper into James' childhood; to his parents and that Presbyterian church. Voyaging further back in time, the Colony of New York in my sights. footnote: My Faulkner male ancestors revealed in these writings will be treated to more in depth sketches at a later date.